A recent column in The Tennessean explored the writer’s opinion that her generation is too concerned with superficial matters, much more so than her parents’ generation. She told the story of a diamond ring she purchased for her mother to replace the old $5 wedding ring her father bought decades ago. She was sure that her mother would love the sparkling new diamond ring. Her mother politely returned the gift, saying she preferred to wear the $5 ring because it was much more meaningful. This struck me as a good lesson for our children. As parents of three young adults, my wife Linda and I hope that we also are teaching our children that there are deeper meanings in our culture, meanings that can be seen through the lens of our Catholic faith. The glamour of a new car or new clothes, the fame of being on YouTube, or spending lots of money on meaningless stuff – all these things pale in comparison to the warmth of true friendship, the joy in a young child’s laugh, and the peace from thoughtful prayer. Fortunately, we took a giant step in the education of our children when we sent them to Catholic schools. Not only did they get a superb education, they learned that there is more to life on this planet than to consume and be entertained. They learned about working hard as a team to achieve a common goal, respecting others and being true to God’s word. These lessons were reinforced a couple weeks ago when I sang in the pit choir for the Father Ryan High School Purple Masque Players’ production of Seussical, a musical that combines a number of storylines from the works of Theodor Geisel, a.k.a. Dr. Seuss. 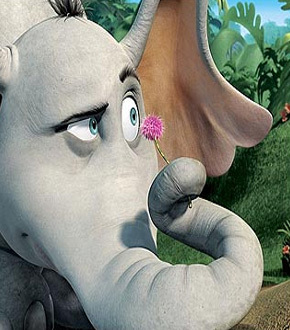 Horton the Elephant is a kind-hearted pachyderm that hears a faint voice floating through the air on a speck of dust. The voice is one of the Whos, an entire planet of microscopic individuals. The speck of dust lands on a stem of clover, which Horton must protect from mischievous monkeys, a sour kangaroo and a black-bottomed eagle. One creature that appreciates Horton’s big heart is Gertrude McFuzz. Gertrude is a bird with a beautiful voice but below-average plumage. She can’t get Horton to notice her and blames the situation on her one-feather tail. So to attract Horton’s attention and affection, she follows the advice of Mayzie LaBird, another bird with an amazing tail. Mayzie tells Gertrude to visit Doctor Dake by the Lake and get some pills to artificially enhance her tail. Pleased with the initial results, Gertrude goes overboard and takes lots of pills. But her colorful tail grows so large and long that she can’t fly. Even walking is a struggle as she drags the tail everywhere she goes. In the end, she asks the doctor to pluck the unnatural feathers out, leaving her simple, natural tail. Horton finally notices her; not for her tail, but for her character. Amazing Mayzie finds herself in a strange predicament: sitting on an egg she laid after “three weeks of bliss” with Tweet McFirth. A free spirit and not interested in settling down to raise a youngster, Mayzie convinces reliable Horton to sit (carefully!) on her egg while she takes the afternoon off. Horton agrees to egg-sit for a short time, as long as Mayzie returns in a few hours. From my vantage point, high school students, adults and grade school students enjoyed the production and the messages beneath the story. The students from St. Ann School even showed up wearing their own Dr. Seuss character costumes. It’s good to know that our Catholic schools are using contemporary literature to illustrate the substantial, deeper meanings of our culture. On May 18, our son Tommy will walk down the aisle with his Father Ryan classmates during graduation exercises, the last of our children to do so. As they all take the next step towards adulthood, may they remember the lessons of their Catholic education and walk into deeper relationships with God and their faith. First published in the May 16, 2008 issue of The Tennessee Register.